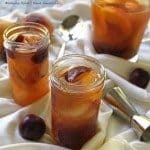 This Peach and Plum Brandy Sangria pairs sweet fruit with your favorite white wine and a little brandy for an extra kick. Not too sweet, perfect for sharing when the weather gets warm! When the weather turns warm, we start thinking about Georgia peaches down south. There is nothing that is better than biting into sweet, ripe, fresh fruit when it is in season. Except maybe adding it to a little wine and brandy. Because who doesn’t love a cool cocktail on a hot day. Sangria is perfect because it is built for sharing. So close your eyes and think of the warm weather that is coming. Put your feet up at the pool and pass a glass to all of your friends. See how good that feels!? There are as many sangria recipes as there are recipes on the internet. Everyone has their own opinion about what makes sangria great. I have heard the line that you can use cheap wine for sangria. While I like to give all wines a chance, I don’t particularly want wine I wouldn’t drink out of a wine glass in my sangria either. That doesn’t mean the wine has to be expensive. Just one you actually like. I also really like to cut the pieces into large pieces rather than small cubes. When the Peach and Plum Brandy Sangria is gone, you get a second course by spooning out the wine soaked fruit in the pitcher. Yum! Also make sure you let the sangria sit in the fridge for a few hours – or even overnight. It is really tasty when all the flavors mingle and the fruit soaks up the wine and brandy. Looking for more delicious peach recipes? 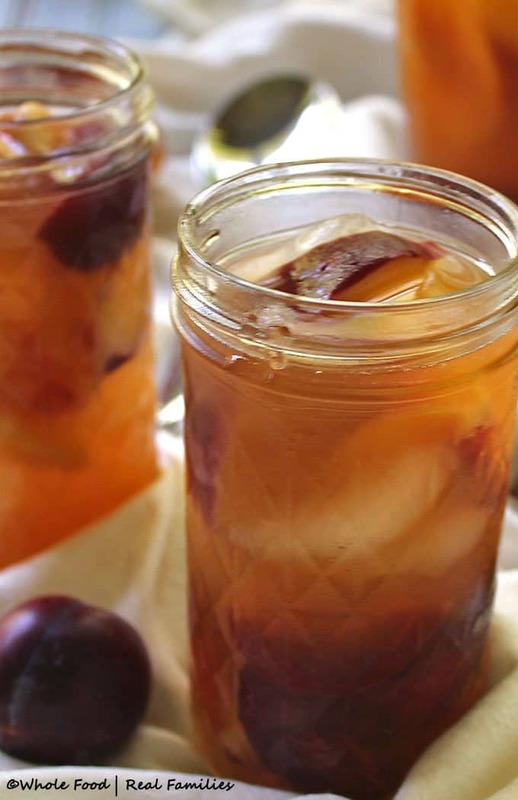 This Ginger Peach Sangria is the sweeter sister to the Peach and Plum Brandy Sangria. If you have every visited Whole Food | Real Families, then you already know that I look for every possible opportunity to pair ginger and peaches. We also love this Peach Maple Mascarpone Dessert Pizza. It is rich and decadent and EASY! That makes it a huge win at our house. Combine white wine, peach nectar and brandy in a large pitcher. Add sliced fruit and stir gently. Allow the sangria to sit in the refrigerator overnight (or at least a few hours). Serve over ice with a little fruit in each glass. When the sangria is gone, enjoy all the yummy fruit! Enjoy!